Looking for something new this Derby? Skip the pie and try this tasty treat! We make our tart with a ground pecan crust filled with bourbon chocolate ganache. Topped with a dollop of fresh cream, it’s perfect for your Derby Day Festivities. This tart is all about the chocolate, so be sure to buy a high-quality chocolate. If you’re using bourbon in the whipped cream, any bourbon will do; however, we prefer Makers Mark for its sweet flavor. Butter a 9” square or round tart pan with fluted sides and a removable bottom. Place on a baking tray. Preheat the oven to 350 degrees. Place the pecans on a baking tray and toast the pecans for 10 minutes. Remove from the oven and cool. Place in a food processor or mini chopper and grind until fine ground. In a large bowl, combine the ground, cooled nuts, flour, cocoa, and salt; set aside. In a separate bowl add the butter and sugar. Using a hand or stand mixer, cream the butter and sugar together, mixing for about 3-4 minutes on medium speed, scraping the bowl down as needed. Add the egg and water and beat for another minute. Reduce the speed to low and add the flour mixture. Mix until just combined. Add the dough to the buttered tart pan and press to fit the bottom and all the way up the sides. Cover with plastic cling wrap and refrigerate for 3-4 hours. Preheat the oven to 375 degrees. Line the tart pan with buttered foil (butter side down on the dough) and fill with pie weights or beans. Bake for 20 minutes. Remove the foil and the weights. Return the crust to the oven and bake 10 minutes longer. Remove from the oven and cool completely. In a bowl, add the chopped chocolate. In a small saucepan, heat the cream to very hot. Pour the cream mixture over the chocolate and stir to melt the chocolate completely. Add the butter, one tablespoon at a time, melting completely before adding the next tablespoon. Stir in the bourbon. 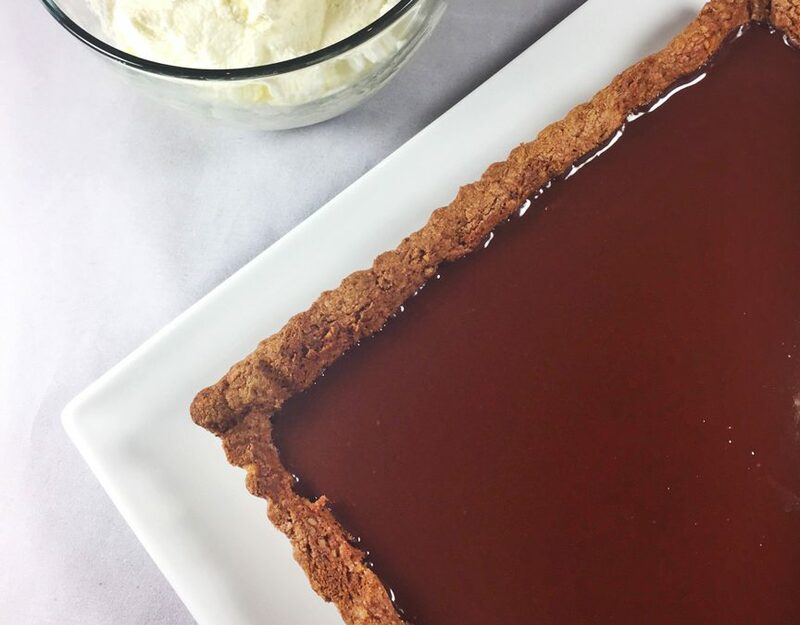 Pour the chocolate ganache into the tart shell and smooth the surface. Chill until set. Remove and bring to room temperature before cutting. In the refrigerator, chill a medium metal bowl and the beaters to an electric mixer for 20 minutes. Add the cold cream to the bowl and using an electric mixer, beat the cream with the sugar until soft peaks form. Add bourbon (if using) and vanilla and continue to beat until stiff peaks form.